After four years with a lattice-work grill, the 1969 V4 models featured a new design, with horizontal chromed bars. This design change allowed the installation of rectangular headlights with improved low beam. The blinker-parking lights were moved to the fenders. Also new for 1969 were the badges and the hubcaps. In 1969 a new corporation was formed in Sweden, Saab-Scania AB, the result of the merger between Saab Aktiebolag and Aktiebolaget Scania-Vabis. All motor vehicle activities, including passenger cars, trucks and buses were concentrated to the new corporation's Automotive Division and headquartered in Sodertalje, just south of Stockholm. The division had production facilities in some 12 different communities in Sweden, from Lulea up in the north to Sibbhult in the south. Saab cars continued to be made in Trollhattan, with components arriving from plants in Gothenburg, Kristinehamn and Nykoping. Later on, additional component plants were built in Kramfors and Arlov. 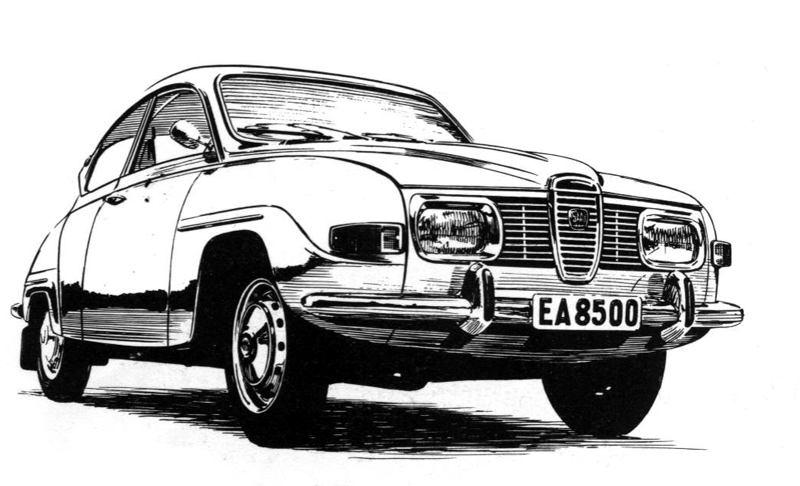 Another important even during 1969 was the first Saab car production in Finland. A new factory, jointly owned by Saab-Scania and the Finnish company Oy Valmet Ab, was opened in Uusikaupunki on the shores of the Baltic. 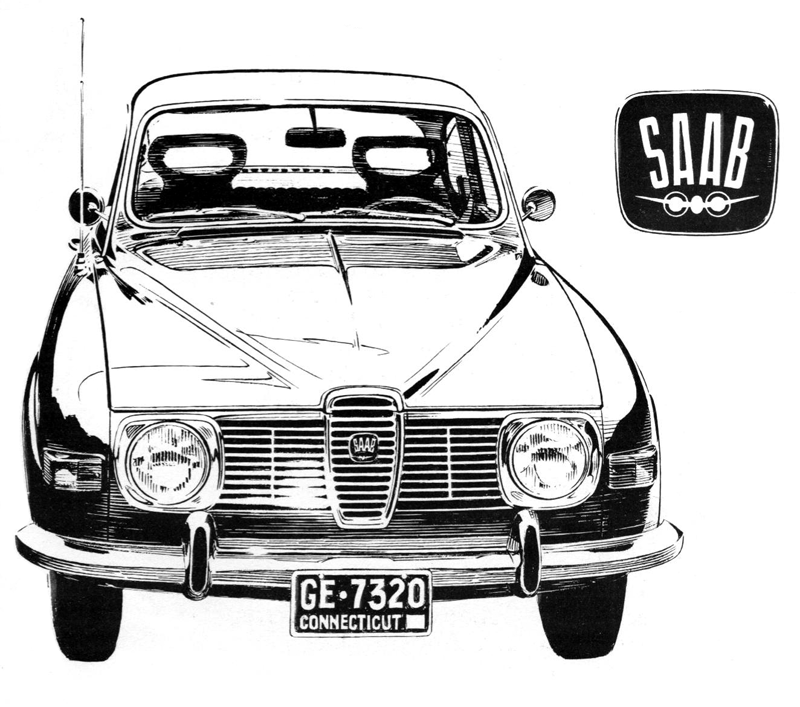 For export to the U.S. Saab had to use round sealed-beam headlights, a type no longer allowed in Sweden. Thus 95 and 96 models for America looked a bit different in the front. Different rear-view mirrors were also used. Here is a U.S. 96 from 1969. The new 99 continued the Saab traditions. The shape was designed by Sixten Sason, who once again showed that he could see into - and design for - the future. This time he had help from his assistant Bjorn Envall. Only one model was available the first year, a two-door sedan with an 80 hp engine and manual transmission. In its first year Saab 99 came in the following colors: black, red, white, blue, green and light tan. All had the same two-door unit body, and an in-line four-cylinder 80 hp engine with a displacement of 1,709 cc. The four-speed gearbox was controlled with a floor-mounted gear shift lever. Loaded with fuel and ready to drive the 99 weighed in at 1,060 kg (2,340 lb. ), 61 percent of which was carried by the driving front-wheels. Total length was 4,354 mm (171.5 in.) and width 1,676 mm (66 in), but it could still match the inside space of most much larger cars. Three persons could sit in the backseat without crowding. And with adequate knee space. Saab had not tried to make a modern status car, but figured that common sense and versatility could last both longer and better in the competitive car market. One example of this was the fold-down seat, which allowed - once the rear seat was folded down - a longer and flat load platform all the way from the rear to the folded down seating pad. To the general product description for the 99 can also be added that it had disc brakes and coil springs both front and rear; that the transmission was mounted beneath the engine; that the engine was of the cross-flow type and had an overhead camshaft. Saab 99 was made in 19,411 units during 1969 and during the year made it to fifth place in the Swedish registration statistics. During the same year 509 Sonetts were built; 9,407 95 models; and 32,384 96s. In the new Finnish factory 359 cars were assembled. 95/96 news for the 1969: redesigned grill, headlights and side lights; new hubcaps; power assisted brakes; new steering ratio; telescoping steering column; cross-flow radiator with expansion tank; front-seat head restraints and rubber horns on the bumper guards.